While talking about what happens after you die can be a difficult topic, avoiding the issue can be a very costly mistake for your heirs when the inevitable occurs. Taking the time to plan your estate can ensure that your assets are distributed according to your wishes, and that your heirs are spared needless legal headaches trying to sort out your possessions. 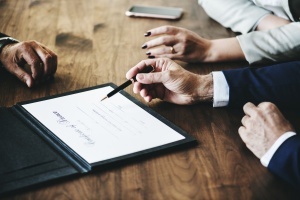 In addition to your last will and testament, estate law deals with how to set up things like living wills, trusts, choosing executors, and navigating through probate. Estate laws often vary from state to state. For this reason, anyone beginning the estate planning process needs a thorough grounding in the laws of the state in which he resides. The term living will tends to confuse people especially because it is actually not a will at all. Instead, a living will is a legal document that states how you want to be treated in case you become unconscious or medically incapacitated. It is often referred to as a health care directive. Its advantage lies in the fact that it removes the stress of making difficult end-of-life decisions from your family members. Its main requirement is that the person making the will is mentally competent at the time it is created. Wills and trusts are legal documents that dictate how someone’s estate will be distributed after their death. While they are usually grouped together, they fulfill separate purposes. The main advantage to a will is that a person can prescribe exactly he wants his assets transferred. Whether someone has real estate, multiple bank accounts, or even valuable jewelry, a will can eliminate any conflict or confusion over how to allot those possessions. A trust, however, achieves a different purpose in that it enables someone to control their estate after they are gone. Essentially, a trust directs how and when assets will go to a beneficiary. While many people may not see the point of managing possessions after their death, a trust can be useful if one’s beneficiaries are not old enough or competent enough to oversee those assets for themselves. In addition, New York Trust Laws help to keep the estate from winding up in the state’s bank accounts. Another reason trusts are attractive to many is that they avoid the typically confusing and lengthy probate process because assets placed in trust become the property of the beneficiary instead of the person who created it. Since these assets no longer belong to the estate, they also reduce an estate’s overall tax liability. A topic which has received a great deal of publicity over the past few years on both state and federal levels is the estate tax. While many people resent having to pay tax on an inheritance, a number of states have eased the strain by raising their tax thresholds in recent years. For this reason, anyone involved in estate planning needs to be up-to-date on the latest changes. Although New York does not have an inheritance tax like New Jersey, it does have an estate tax. A little more than four years ago, however, New York made radical changes to its estate tax. At the time, it had one of the lowest tax exemptions in the United States. Nevertheless, the current New York estate tax threshold is now $5.25 million in 2018 and it is set to rise to $5,490,000 in 2019; it will to increase along with inflation each year thereafter. This means that only amounts above the threshold will be subject to the tax. Due to the many different parts involved in planning end-of-life care and transfers of assets, it is always important to speak with a knowledgeable estate planning attorney in your jurisdiction in order to gain a clear perspective on what the tax liabilities are, and how you might lessen the burden for your heirs.